Have you ever just felt a bit lazy come lunch time? You don’t know what to make – the fridge is pretty bare. We’ve all been there, right? When I find myself in that predicament, this easy Balsamic Chicken Salad often comes to mind when I’m short on time AND ideas. I feel a bit silly sharing this recipe today because when you see what’s in it, you’re going to roll your eyes at me. You might even unsubscribe to my blog. PLEASE DON’T! I promise you I wouldn’t be sharing this recipe with you if it wasn’t delicious. I had good intentions on sharing this recipe earlier this summer because it’s also an absolutely perfect salad to serve when camping or on-the-go. There are really only three ingredients in this salad, minus the shredded cheese for garnish. Yep, that’s it. 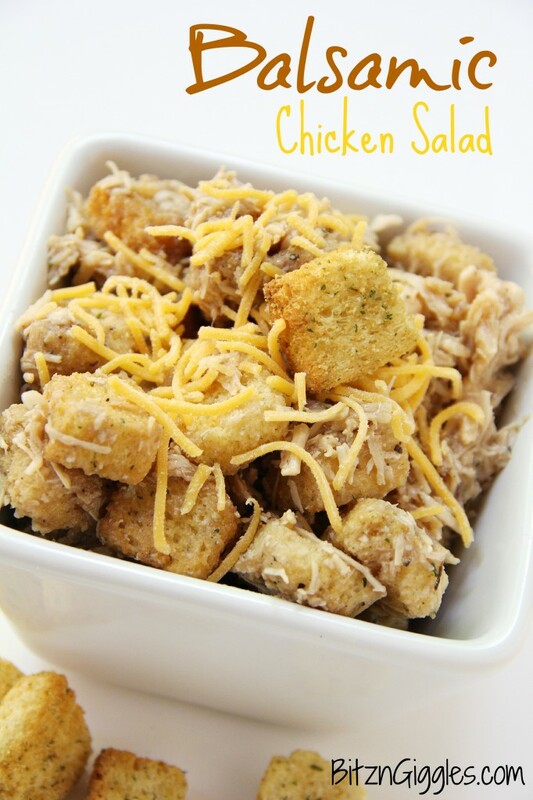 Canned chicken breast, balsamic vinaigrette dressing and croutons. Is this a joke? No, it really isn’t. 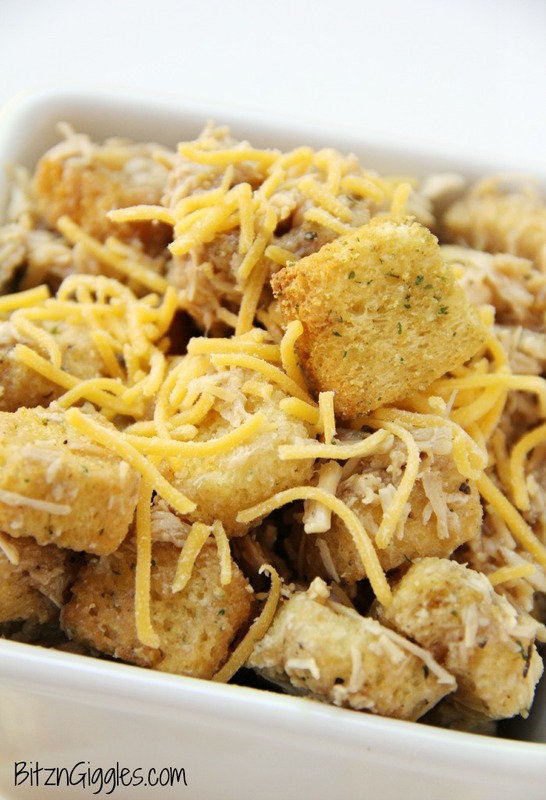 Make sure the chicken is finely shredded, add the balsamic dressing, the croutons and mix it all together. Once the salad sits a little while, the balsamic dressing soaks into the croutons and everything infuses with flavor. If you want to serve this salad on crackers, I would just omit the croutons and pile the balsamic chicken onto a seasoned cracker. I’ve never tried it that way but I think it might be an excellent idea for a tailgating party! Sprinkle a little shredded cheese on top for garnish. I used cheddar but you could use Parmesan or mozzarella, too. While this may be the easiest chicken salad recipe you’ve ever seen, it packs a flavorful punch and people will ask you how you made it, guaranteed. It may very well become one of your go-to recipes when you find yourself at a loss of what to make for lunch or serve as a quick appetizer! 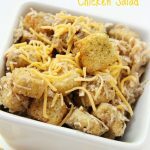 The easiest and most delicious chicken salad you’ll ever make! Add canned chicken breast to a bowl and use a fork to mash it into fine pieces. Add 1/2 cup balsamic vinegar to the chicken and stir. 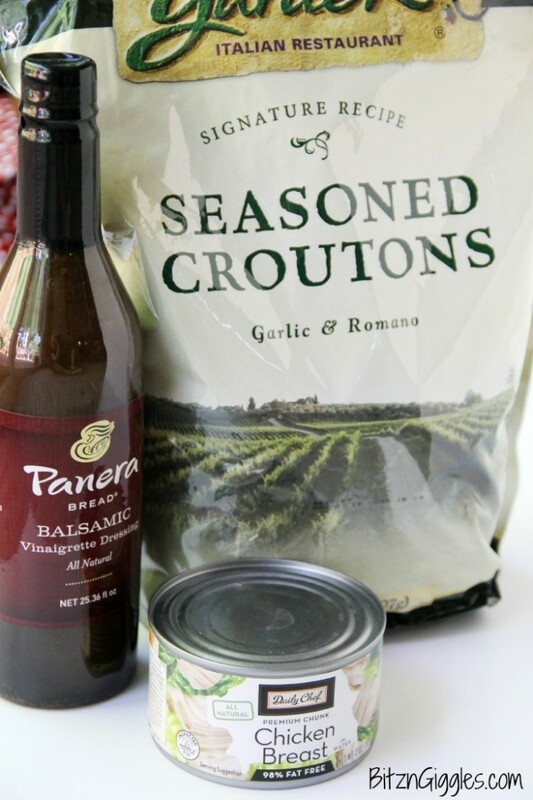 Pour in the croutons and the rest of the balsamic vinegar and mix until combined. Top with shredded cheese for garnish. Great recipe- very original- pinned it. Found your blog on the Link Party Palooza and started following on Google +. Thanks, Erin! Hope you try the Chicken Salad and thanks for the follow!